Dallas, Texas-based Heritage Auctions (HA.com) generated $49 million in 2017 sales of World & Ancient Coins, the company announced Wednesday, Dec. 3. Noting that the category was its fastest growing and registered as the second best year on record, the auction firm credits interest in the coins for its international expansion. "The growth in World & Ancient Coins is significant and is energizing Heritage’s global expansion," said Cristiano Bierrenbach, Executive Vice President of Heritage Auctions. "Offices in Hong Kong, Amsterdam and our latest office in London are all expanding the level of service we can provide clients in this increasingly diverse marketplace." Heritage’s expansion to London added experts Max Tursi and Nicholas Mathioudakis to the category in September. Specialists in world coins, the two also have extensive experience in ancient coins and paper money, particularly of the Middle East, European medieval, Islamic and modern coins. World & Ancient Coins started the year with its highest-grossing auction to date when more than $15.5 million changed hands in January 2017. Heritage’s World & Ancient Coin auction held in conjunction with April’s inaugural Chicago Coin Expo set a $282,000 world record for an 11-piece 1826 George IV Proof Set. More than 2,800 lots sold during the four-day, $6.38 million event. The category set another world record when the most valuable coin of the pre-Kingdom Dutch provinces, a 10 dukat "Portugalöser" struck by the city of Deventer in the year 1640 to compete with Portuguese coinage circulating in Brazil, sold for $179,000 in June. For the first time in Heritage Auctions’ official American Numismatic Association Auction sale, a world coin bested its U.S. counterparts to claim top-lot honors in August 2017. 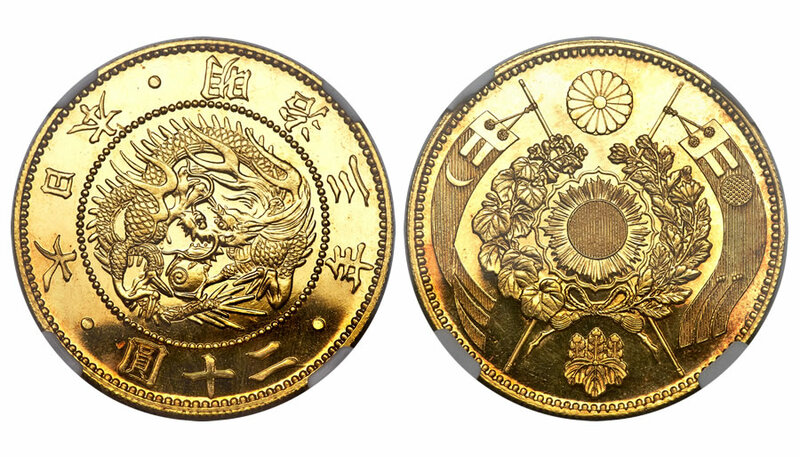 An 1870 Japanese Meiji gold Proof sold for $470,000, against a $100,000 estimate. The world and ancient coins section realized more than $7 million from 1,477 bidders. In September, the category saw participation reach a record 3,723 bidders from around the world during its Long Beach Expo Auction. In December, the world and ancient coins and currency cleared more than $5.4 million to set a record for the firm’s highest-grossing World Coins and Currency auction event held in Hong Kong.